We can provide both removable and non-removeable tamper resistant screws to meet the security requirements of your next project. Our range of 6-lobe pin screws are ideal for applications which require a moderate level of security. These screws are tamper resistant with a central pin inside the 6-lobe recess preventing removal with standard tools. A special screwdriver or screwdriver bit is required to install or remove these screws, which deters both opportunistic vandalism and theft. 6-lobe pin screws offer a cost-effective method for preventing such activity and are becoming increasingly common in the construction industry. Fixings using the 6-lobe pin screws are reusable and are suitable for use in areas where ongoing maintenance will be required. 6-lobe pin screws are also known by a variety of names such as: Resistorx®, Star Pin Drive, Tamper Proof Torx or Torx Pin screws. The head design of 6-lobe pin screws makes them suitable for higher torque applications as they resist cam-out better than other standard screw heads. Our 6-lobe pin range includes common sizes in an A2 Stainless Steel finish. We have self-tapping and machine screws available, with either a button or countersunk head. As mentioned these screws require specific 6-Lobe Security Screwdriver Bits to install and remove. We also provide Sentinel screws which offer a permanent security solution. Sentinel screws can be fastened using a pozi-drive screwdriver or screwdriver bits. Their design only allows them to be turned in a clockwise motion so they are easy to fit but very difficult to remove. Due to the unique shape of the head, the screw cannot be turned or loosened in an anti-clockwise direction. 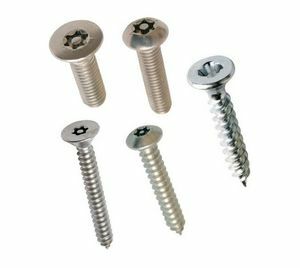 These screws are ideal for use in places such as stations, prisons and public facilities which require a certain level of security for their fixings. The design of the drive makes Sentinel screws suitable for higher torque applications and ideal for high volume installations. Our Sentinel range includes common sizes in a BZP finish with a countersunk head. So, if you need a tamper or security screw for your next project contact our team for more details or a quote on 01322 274226 or sales@fixmart.co.uk.